We have any type or style western badge that you may be looking for. These are all replica or reproduction badges that have all the details and weight an of original authentic western badges. Click Here To See Details and Product Options Brothel Inspectors Badge. 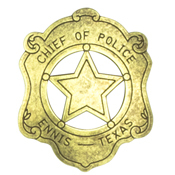 Brothel Inspectors Badge 3" X 3"
Chief Of Police Badge - Ennis Texas. Has same look as the original. Very nice replica. Click Here To See Details and Product Options Deluxe Marshal Deadwood Badge. Click Here To See Details and Product Options Deluxe Pony Express Badge. Click Here To See Details and Product Options Deluxe Sheriff Badge. Click Here To See Details and Product Options Deluxe Sheriff Cochise County Badge. Click Here To See Details and Product Options Deluxe Sheriff Tombstone Badge. Click Here To See Details and Product Options Deluxe Texas Ranger Badge. Click Here To See Details and Product Options Deputy Sheriff Badge. 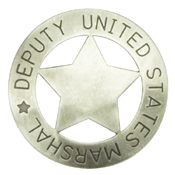 Deputy United States Marshal Badge. Has same look as the original. Very nice replica.